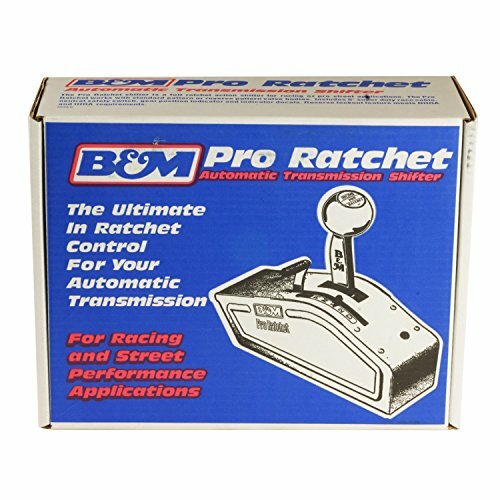 The B&M Pro Ratchet is a stout shifter, with a no-nonsense style that matches its functionality. It is cable operated for easy installation and precise shifting, and a 5 foot Super Duty race cable is included. The single hand operated reverse lockout feature meets NHRA and IHRA requirements, and it's easy to 'double shift' with an air, CO2, or electric shift mechanism. The short throw ratchet action reduces shift time, and always returns the stick to the center position after a shift. A lightweight brushed aluminum cover is included, as well as a neutral safety switch, backup light switch, and gear position indicator. It works with either standard or reverse pattern valve bodies, so forward and reverse pattern indicator decals are also supplied.